I've made a few changes to the blog. The layout has been widened and posts re-edited some with new information, although this is an on-going process! There is now a 'Recent Comments' box in the right-hand menu along with a box linking to random posts which generates new results every time the page is refreshed. The 'Popular Posts' section has been reduced to just the title of the post and no longer shows a thumbnail or post summary. The search engine at the bottom of the page still displays results against a dark background, which is almost unreadable, but I'm not sure how to fix it at the moment. The Twitter and FB buttons have been altered and I've also added a new banner which shows the north crescent of Bedford Circus. I think it looks quite good and is an improvement on what was there before! As it stands today Nos. 65 & 67 is one of the most impressive examples of neo-Classical architecture in the city. Like Nos. 70 & 71 on the High Street, Nos. 65 & 67 partly owes its current appearance to the major redevelopment which took place between 1903 and 1905 in the vicinity of St Petrock's church. Nos. 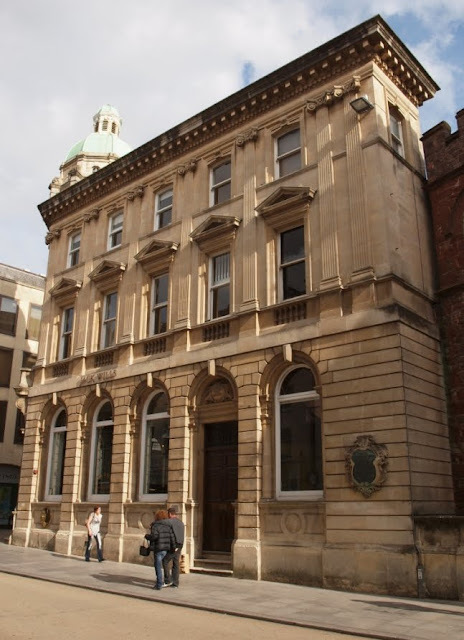 65 & 67 is the result of a merger in 1901 between two of Exeter's oldest banks: the Exeter Bank, founded in 1768 and the City Bank, founded in 1786. These two banks then merged in 1902 with a London bank, Prescott, Dimsdale & Co, followed by yet another merger in 1903 with the Union of London & Smiths bank. (This bank was later to become part of National Provincial whose name partly lives on as the National Westminster bank.) 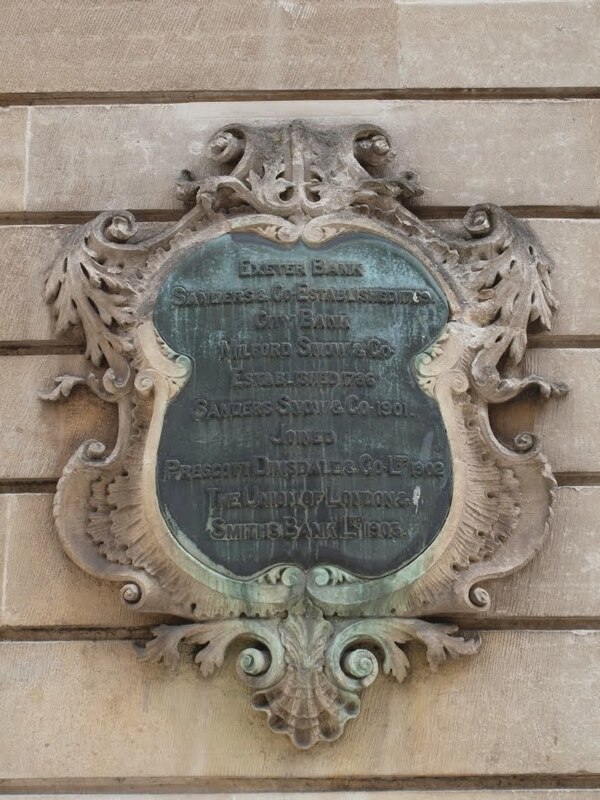 The mergers from 1901 to 1903 were commemorated in a large plaque which still exists on the High Street facade of Nos. 65 & 67, right. 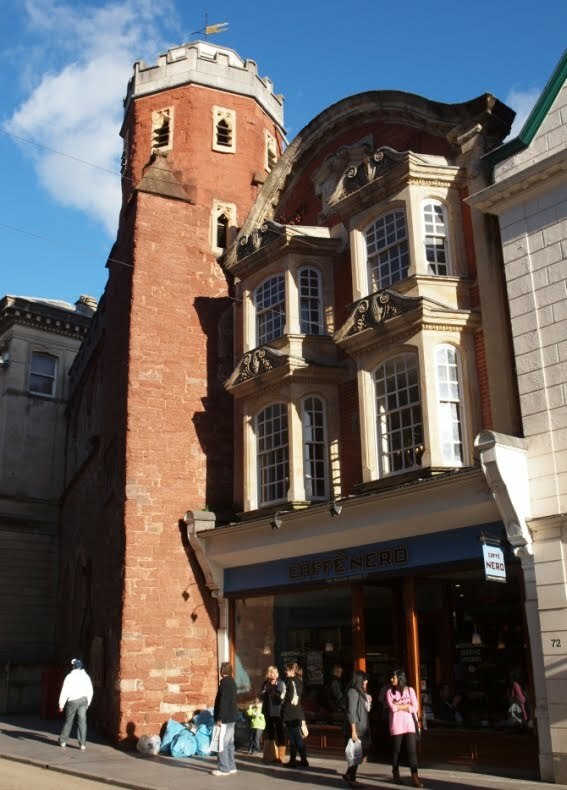 The City Bank already owned premises in Cathedral Yard but it was decided to erect another building adjacent to it for the Exeter Bank, and this is the building which now sits on the corner of the High Street with Broadgate. The construction of the new building in 1905 coincided with the plans to demolish the properties surrounding St Petrock's church. 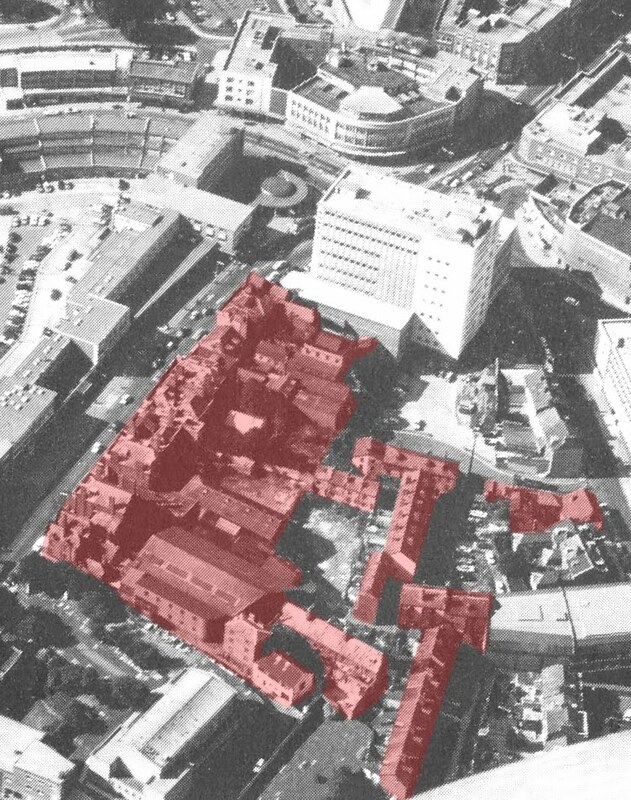 Instead of building on the exact footprint of the property which previously occupied the site, the line of the High Street frontage was moved back towards the Cathedral Yard. A photograph in the Westcountry Studies Library dated 1905 shows the bank under construction at the same time as Nos. 70 & 71, on the other side of the church, were being demolished. Clearly there was some synchronisation between the clearance of old properties around the church and the construction of the new bank. 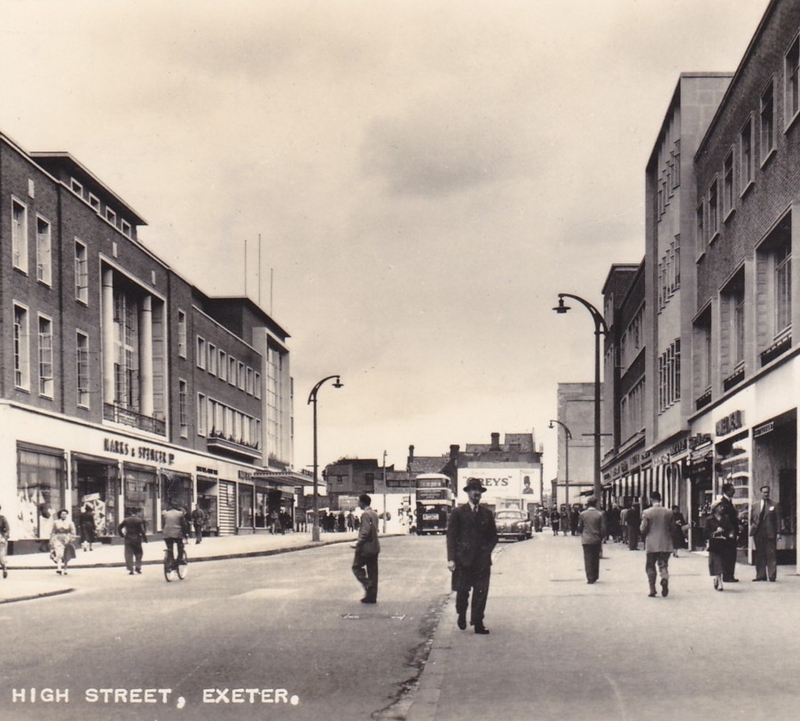 Unfortunately little is known about the buildings that the Exeter Bank replaced. I've never seen a photograph of them. One small but fascinating piece of information has survived though concerning what was No. 65. It seems that this building had groin vaulted undercrofts, the only such example that has ever been recorded in one of Exeter's domestic houses. Jenkins mentions the undercrofts in his 1806 history of the city: "Near the Church, under the house now occupied by Mr George Cox, is a cellar; which, from its arched stone groins, has occasioned conjectures, that it was originally the crypt of an ancient chapel." These undercrofts were destroyed during the construction of the bank and the reason behind their existence will forever remain a mystery. 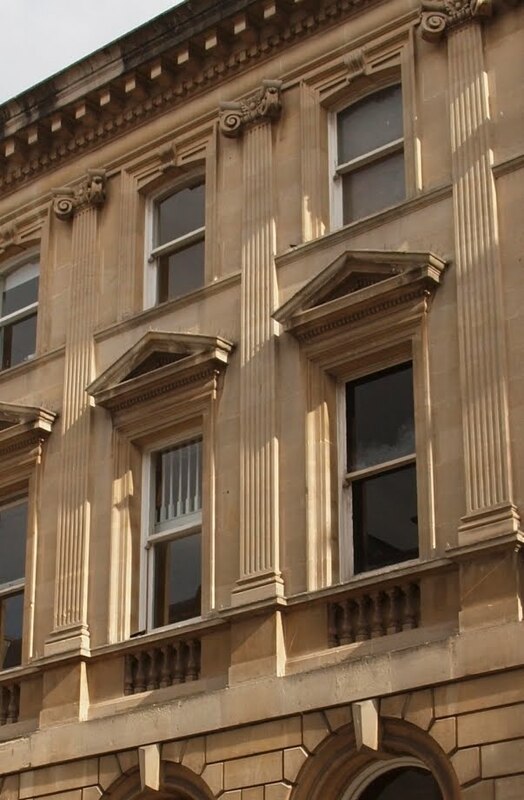 The bank that arose on the site was constructed of beautiful Bath stone. It is three storeys high with a rusticated ground floor. The High Street facade is five bays wide, each bay separated at first and second floor level by pilasters topped with Corinthian capitals. The Broadgate facade is two bays wide, divided again with pilasters. A chamfered corner from the High Street into Broadgate contains the main entrance. The corner facade is just one bay wide , the windows framed with more pilasters and Corinthian capitals. All of the first floor windows have pointed pediments and balustrading and a deep modillion cornice runs under the eaves. The ground floor windows have round arches inset into which are quarter Tuscan columns. 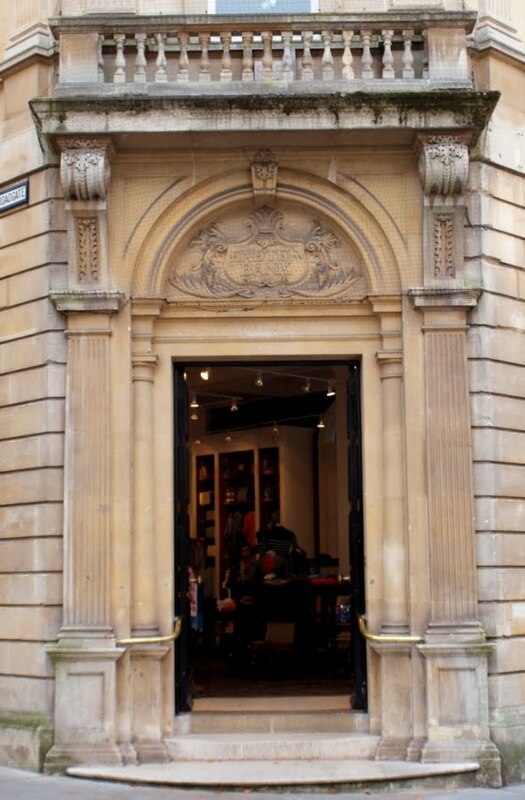 Above the main entrance is a stone parapet supported by enormous corbels decorated with stylised acanthus leaves and within the arch over the entrance is a decorative panel inscribed with the words 'Exeter Bank'. Crowning the corner of the building is a large buttressed cupola with a copper roof. When you actually stop to look at it Nos. 65 & 67 is a magnificent building, although I don't believe that the cupola is a particularly effective addition. To construct the same building today would cost a fortune. 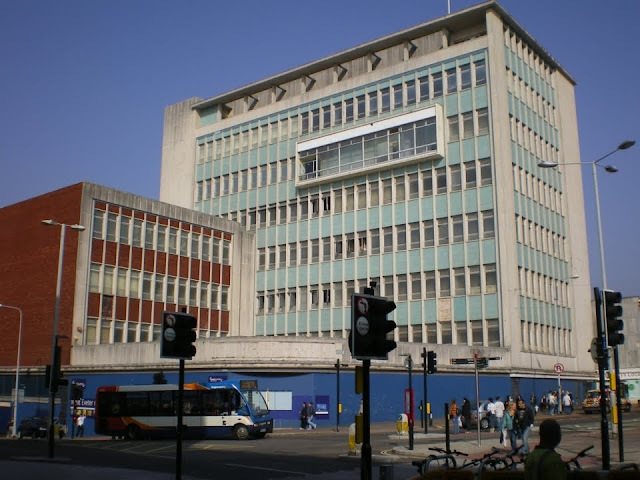 It was granted Grade II listed status in November 1971 and is currently used as retail space. Probably built as a pair c1650, Nos. 211 and 212 survived until the beginning of the 20th century. In appearance at least the property was similar to No. 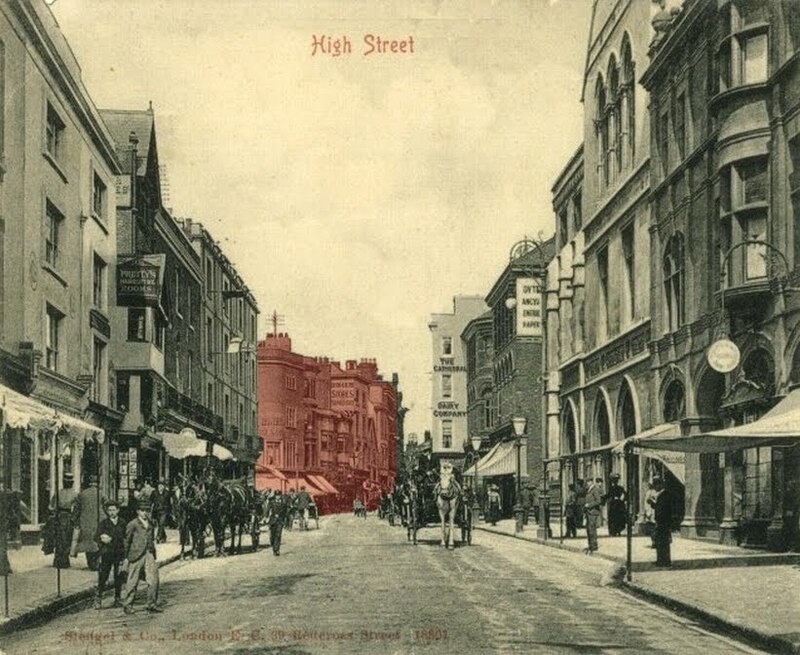 241, High Street (destroyed in 1942) which I've also provisionally dated to c1660. Between 1650 and 1700 there was a gradual development in Exeter towards a much lighter style of timber-framed construction. This new style tended to be characterised by the use of more slender pieces of wood, especially when compared to the massive framing used in such houses as the old Chevalier Inn on Fore Street (also destroyed in 1942) which dated to between c1610 and 1630. As fashion changed, and after the city had been pounded during the English Civil War in the 1640s, there was less desire for the exuberant display of carved timber and multiple oriel windows once seen in such houses as Nos. 19 and 20 in North Street. The lighter method of construction, both quicker and more economical, also probably had its origins in two other factors. One was the amount of devastation wrought on the city outside the East Gate and the South Gate. 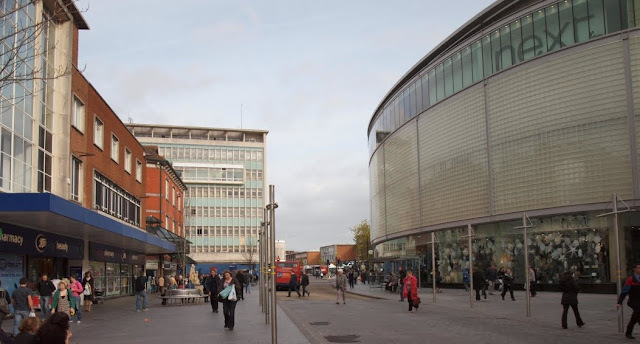 New housing was needed and much of the Eastgate and Southgate areas were completely rebuilt in the immediate aftermath of the Civil War (a large number of these rebuilt houses survived at Southgate until they were demolished in the 1960s). 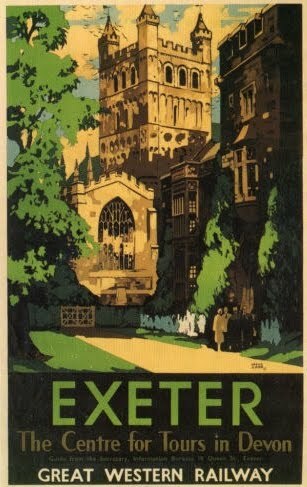 The other factor was a sharp increase in Exeter's population as, by 1700, Exeter was the fourth or fifth largest city in Britain. The postcard view right shows Nos. 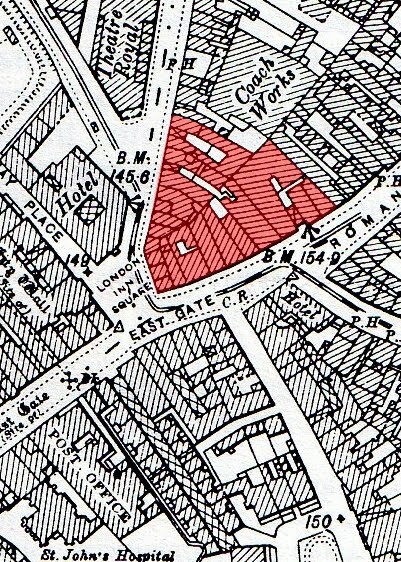 211 and 212 highlighted in red c1900. The portico of the Guildhall is to the left. 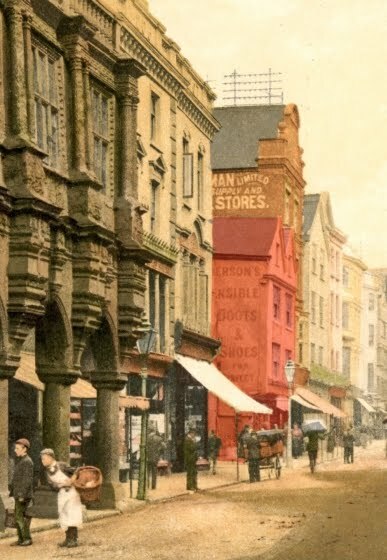 Another characteristic of post-Civil War timber-framed construction in Exeter was a drastic reduction in the oversailing jettied stories which are such a typical feature of the archetypal timber-framed house (and still represented at Exeter in such rare examples as the much-mauled No. 226 in the High Street or Nos. 41 and 42, also in the High Street). Between 1650 and 1700 these jettied floors were either reduced to a few inches or, more commonly, completely replaced with a totally flat facade. Unfortunately, apart from my rambling supposition, I don't know much more about Nos. 211 and 212. 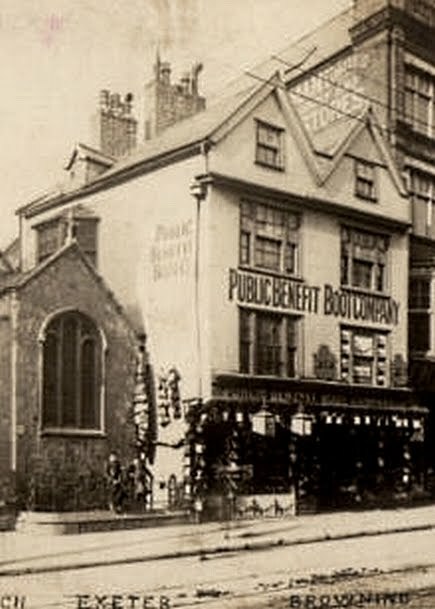 It was located on the north side of the High Street, next to the medieval church of Allhallows. 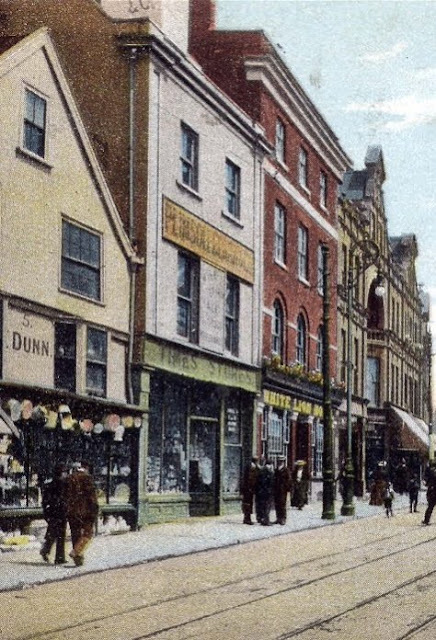 The very rare postcard above c1900 shows Nos. 211 and 212 to the right of the church. 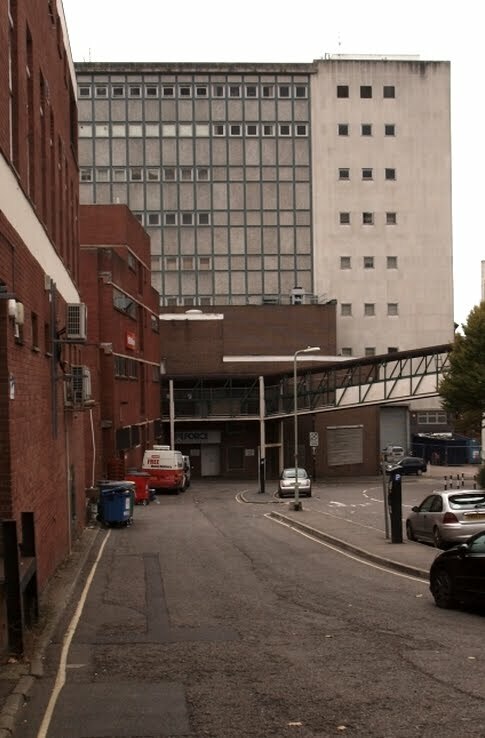 The entrance into Goldsmith Street is to the far left. Note the children balancing on the railings by the east window who provide the scene with a sense of scale. 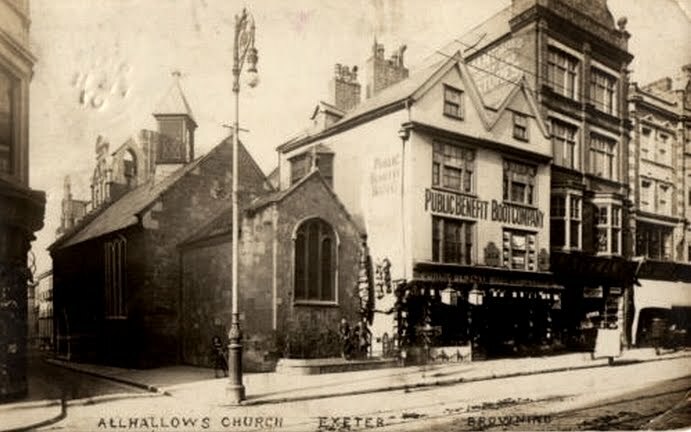 According to Peter Thomas in his book 'Aspects of Exeter', in the first two decades of the 19th century a hosier called Thomas Brown had his premises on the upper floor of the house next to the church and these premises were reached via a narrow passageway called Excise Passage. 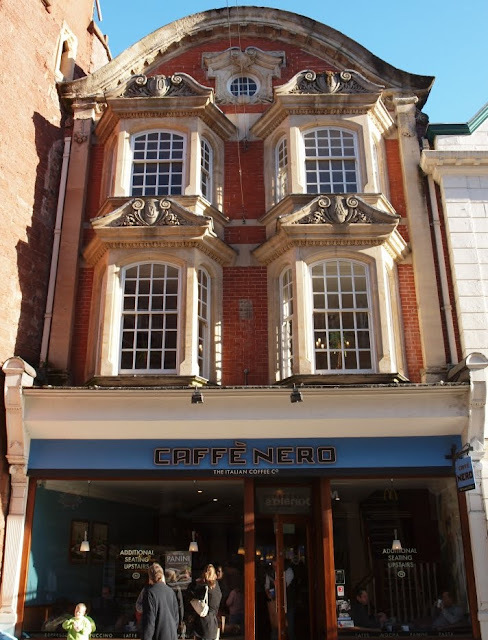 One of the more unusual buildings that remain in Exeter's High Street, the elaborate facade of Nos. 70 and 71 is nowhere near as old as it might first appear. Either side of the oculus window that sits high up on the third floor is the date 1905, the year in which the building was completed. Nos. 70 and 71 stand next to the tower of St Petrock's church. Prior to 1905 the north face of the church was completely obscured by several buildings which had been constructed against it. This had the effect of narrowing the width of the High Street and causing slight problems with the movement of traffic. In the early 20th century it was decided to demolish these buildings as well as the properties that stood within the immediate vicinity of the church. The single building known as Nos. 70 and 71 was a product of this Edwardian redevelopment. 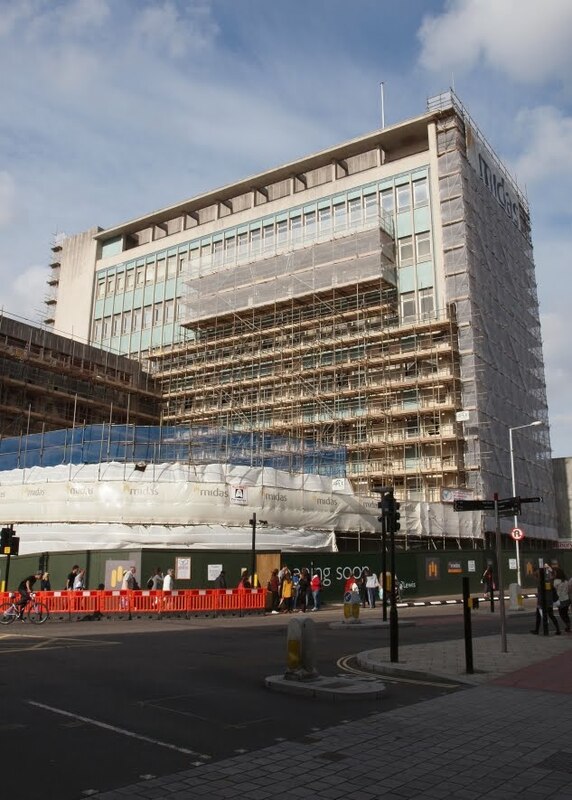 I've never seen a good and clear image of the building which previously stood on the site of the present structure. Fortunately a description of it does survive in a 1931 article by Harbottle Reed which appeared in a volume of the Devonshire Association's journal. Entitled "The Demolition of Ancient Buildings of Exeter During the Last Half Century", the article provides interesting but frustratingly brief details of some of Exeter's lost historically interesting buildings from between 1880 to 1930. According to Reed the property that occupied the site before its demolition in 1903 was "a very fine specimen of early 16th century timber work". It must've once been a prestigious house given its very central location on the High Street and next to the church of what was formerly one of Exeter's richest parishes. The interior "had been sumptuous with linen fold door panels and moulded framing". Apart from the mention of a solid oak staircase leading up to the attic and some oak doors this is, disappointingly, the full extent of Reed's comments. Presumably the oak panelling was ripped out and sold off when the building was demolished. The property which replaced it in 1905 is notable primarily for the free Baroque style of its decorated facade, constructed entirely from brick with stone dressings. Most impressive of all are the two-storey canted bay windows surmounted by beautiful swan neck pediments under which run sections of egg and dart moulding. Set within each of the four pediments are panels of highly-intricate carved foliage, including oak leaves and acorns, and a shield. Carved in relief on the second floor shields are the numbers 70 and 71. The shields on the first floor carry two separate monograms: CM and WM with the letters intertwined*. Pilasters with decorated capitals frame the facade on either side. Someone put an enormous amount of effort and money into creating this facade and in June 2000 Nos. 70 and 71 were awarded much-deserved Grade II listed status. (It should be added that the current property wasn't inspected internally prior to it receiving its Grade II status. It's possible that elements of the older building remain on the site. Its neighbour, No. 72, although much altered, still contains traces of its late-16th century origins.) Nos. 70 and 71 narrowly escaped destruction in 1942 when the corner of the High Street and South Street was bombed. *I don't know the identities of either CM or WM. I would think that they're connected with the person who financed the rebuilding. I'll try and find out and re-edit this post accordingly. Poltimore House is a historic manor house situated about five miles north-east of Exeter on the edge of Poltimore village. It was built by the Bampfylde family* in the 1550s and remodelled in the mid-18th century with further additions made in the early 1900s. It was here that the Treaty of Exeter was negotiated in 1646 following the Royalist surrender of the city during the English Civil War. In the 20th century it was a school and a hospital, and it is now a derelict ruin. It was left to rot from 1974 and almost burned to the ground following an arson attack in 1987. 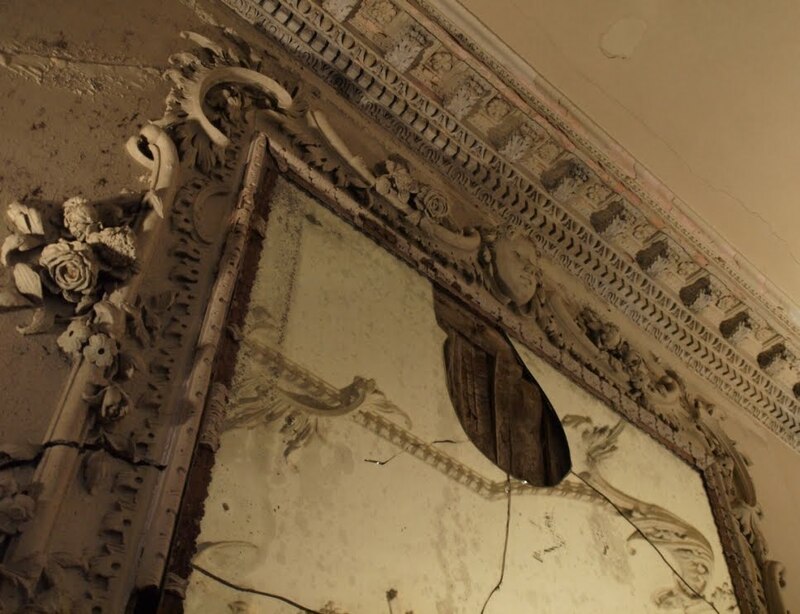 As rain dripped through the roof, thieves stole the magnificent ornamental fireplaces, the doorcases, the floorboards, the mahogany doors and the 1st Baron Poltimore's grand staircase. 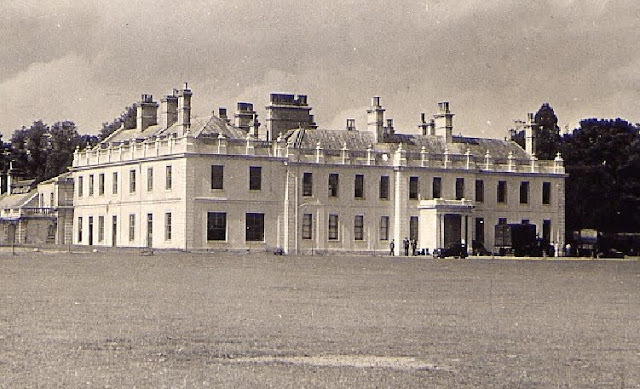 In 2000 the property was taken over by the Poltimore House Trust and with the support of East Devon District Council and English Heritage the group aims to restore the house to a usable condition at a cost of over £5.5 million. Poltimore House was a finalist in the BBC's 'Restoration' series in 2003 and even in its present condition it remains a Grade II* listed building. It is a miracle that the house still survives and shocking that it was ever allowed to fall into such an extreme state of disrepair. I first visited it ten years ago and recently went again when the house was opened to the public as part of the national Heritage Open Day event. The entire building is now encased in scaffolding and it is hoped that work will soon begin on repairing the roof, a mammoth operation. The following photographs were all taken on 11 September 2011. 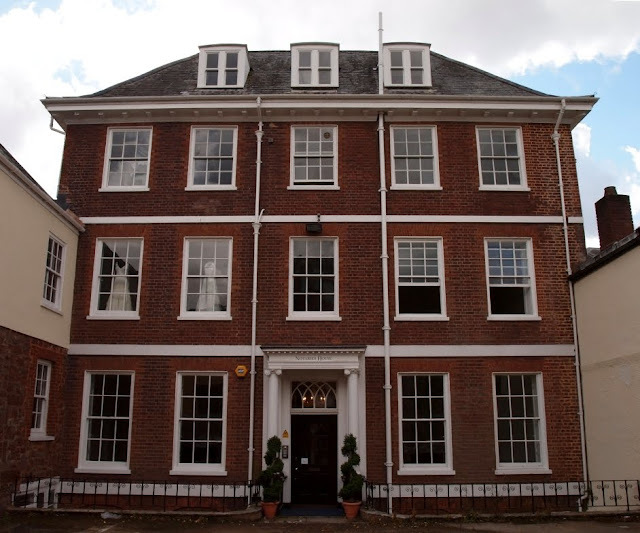 * The Bampfyldes also built Bampfylde House in Exeter, a large, late-16th century townhouse that was destroyed by bombing in 1942. From both a historical and an architectural perspective, the Notaries' House above is an important building. Its history is fascinating and despite some unfortunate modifications its surviving architectural features are of a high quality. 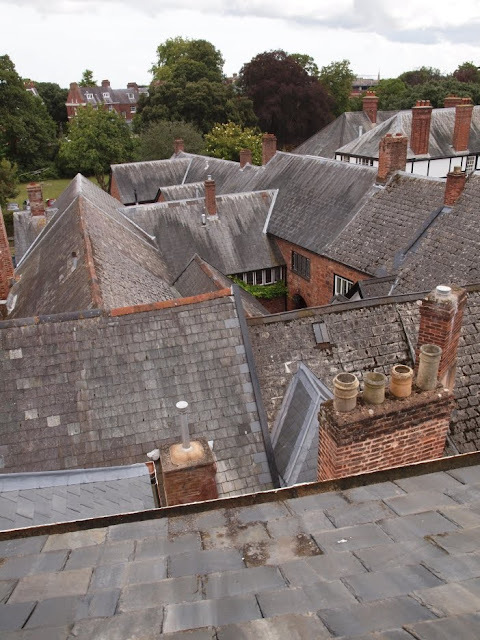 The property's story is complex and dates back at least to the first decades of the 15th century. It stands on the site of what was once part of a group of buildings occupied by members of the cathedral's clergy and which were constructed between c1410 to c1430 around a narrow central courtyard. The west range consisted of a great hall with an exceptional hammer beam roof, known today as the Law Library. There was also an east range, now No. 9a Cathedral Close and a south range, now No. 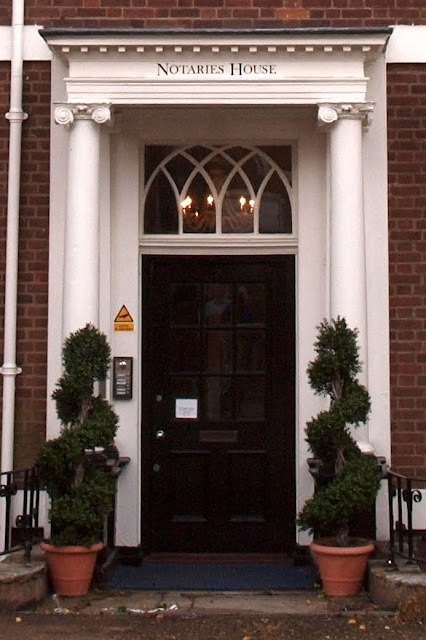 9 Cathedral Close. The aerial photograph right c1930 shows the extent of Nos. 8, 9 and 9a highlighted in red. In the context of the 15th century it would've been a property of enormous size. The Notaries' House lies in the centre of the plot, its main elevation facing north towards the backs of the townhouses of Bedford Circus. At the end of the long garden is a large outbuilding, also highlighted in red, and described on a 19th century plan as comprising "coachhouses with chamber over, stables and hay loft over, and courtlage". Running between Bedford Circus and the stable block is Egypt Lane, later known as Chapel Street. The building to the far right in the photograph, with a three-storey porch, was the Abbot's Lodge, destroyed by a high-explosive bomb in 1942. Nos. 8, 9 and 9a remained as a single residence throughout most of the 16th and 17th centuries. Following the Reformation in the 1530s the cathedral's Dean and Chapter reduced the number of canons residing in the Cathedral Close, preferring instead to lease their large houses to wealthy members of Exeter's gentry. The extensive property was leased to the Bruton family from at least the end of the 1500s until the 1660s. William Bruton is recorded as having paid two shillings for each of his 14 hearths in the 1662/63 Hearth Tax. Clearly the group of buildings constituted a sizeable house. In 1668 it was leased again to Christopher Bale, a member of the gentry who had married one of the Brutons and who was later to become both the city's mayor and and its MP. Bale divided the accommodation of the sprawling house, keeping at least part of the south range, the hall range and the north range together, and sub-let it as two separate properties. 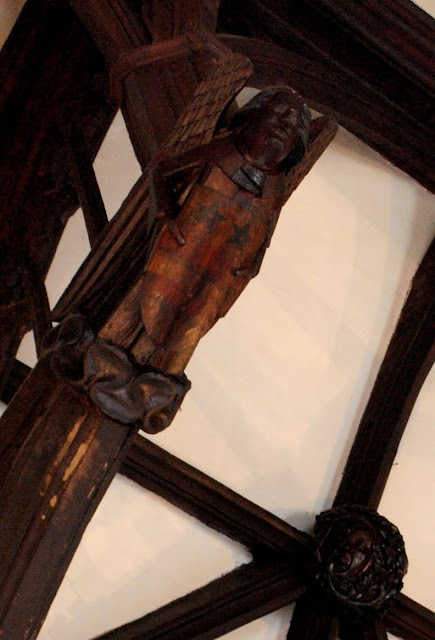 However, it's almost certain that Bale lived in the house at some point himself as the medieval hall contains both his coat of arms, shown above left, and those of his wife, Margaret Bruton, painted onto shields held by the carved angels that terminate the hammer beams. The Notaries' House was born from disaster when a major fire broke out in the extensive medieval north range. According to an entry in the Dean and Chapter Act Book from 1692 the "most and the Chiefest part" of the property "was lately burnt down". Fortunately the thick walls of Heavitree stone prevented the fire from spreading to the adjoining ranges. 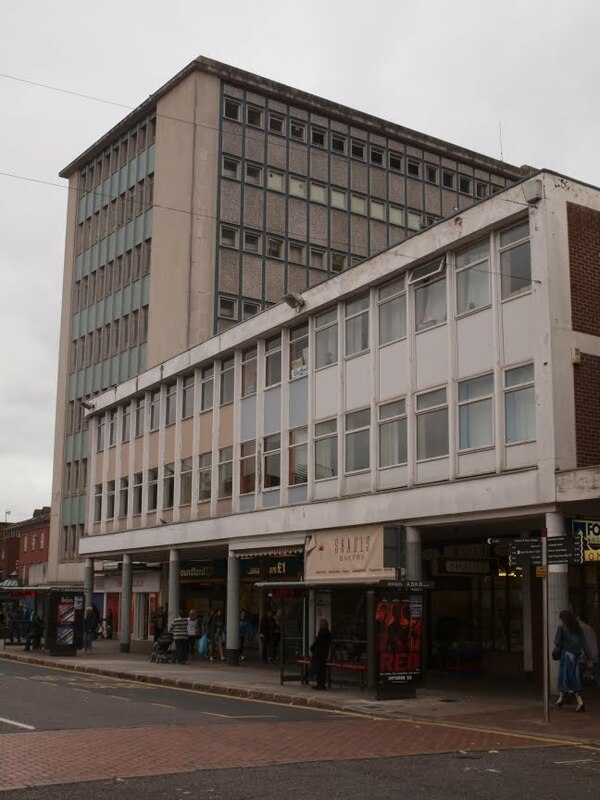 Fortunately in 2007 the city council's own Exeter Archaeology Unit (now sadly disbanded as part of city council cost-cutting) carried out an extensive archaeological survey of the building, recording all of the surviving features from different periods. Some of the following information is taken from their detailed report. The Notaries' House was built to a simple plan: five storeys high, including a basement, and only one room deep with two rooms on each floor arranged around a central staircase. It was only intended to act as a wing, an add-on to the surviving medieval ranges at the front. The photograph at the top of this post shows the north-facing elevation of the Notaries' House. This was technically the rear of the property despite it having the visual appearance of the main street facade. The entrance was in fact through the Cathedral Close via an external passageway to the side of the medieval west range. The aerial view left shows the south side of the Notaries' House almost completely obscured by the earlier medieval ranges against which it was constructed. The building that is attached to the centre of the south wall, projecting at a right-angle, is the medieval west range that contains the tremendous hammer beam roof. The facade of the Notaries' House is highly deceptive as its current appearance belies the early date of construction. 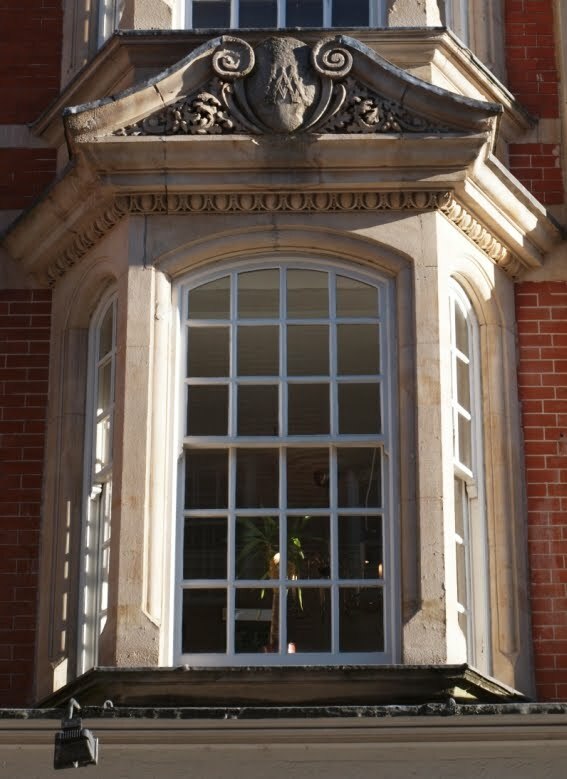 Frustratingly, all of the two-light mullioned windows were altered during a refurbishment in the early 19th century when the current sash windows were installed. Only the basement floor, now hidden below ground level, retains the original late-17th century windows. 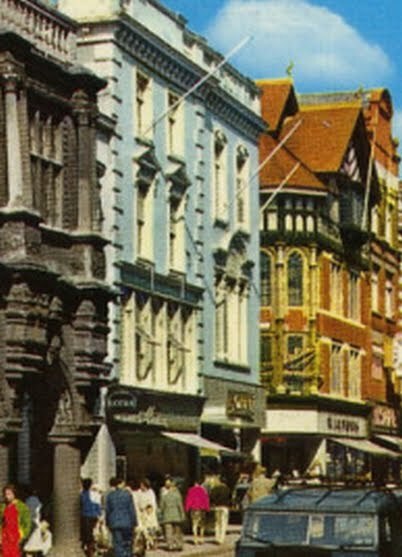 But much worse was the refacing of almost the entire facade in modern bricks sometime in the post-war period. The mass-produced bricks and the clumsy modern pointing do the building no favours, although at least the exceptionally attractive proportions of the late-Georgian refurbishment remain. (Some of the original brick work can still be seen at the corners of the north facade as well as on most of the south wall.) Stone banding at first and second floor levels divide the five bays horizonatally and beneath the original flared hip roof, into which is set three dormer windows, is a modillion cornice. In front of the building is a brick-built cellar. This is believed to date to c1800, a century after the rest of the house was constructed. The building of the cellar would've raised the exterior ground level significantly and it's likely that a flight of steps originally led up into the house itself. The current portico, supported on pillars with Ionic capitals, was added in the early-19th century. The lovely fanlight of intertwined Gothic arches was installed at the same time. Despite its current use as office space the house is stuffed with superb details from the late-17th and 18th centuries. 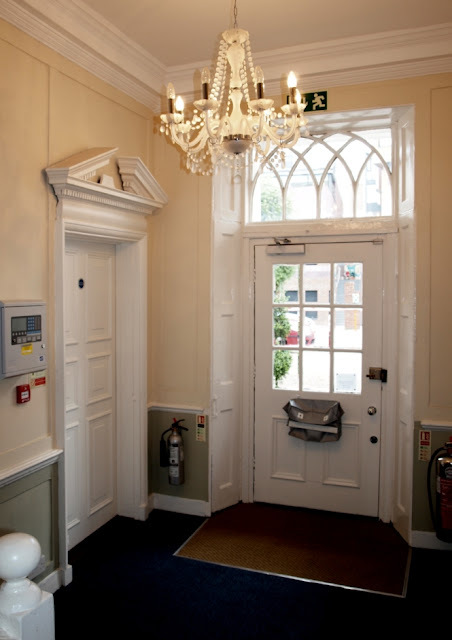 Two internal doorways lead off the entrance hall above right into the ground floor rooms. Baroque doorcases with broken pediments and central pedestals from c1740 still remain within the doorways. These doorcases are rare survivals in Exeter, particularly rare for being of such high quality. The entrance hall also has dado panelling and an ornate box cornice, again from c1740. The original staircase from c1690 left rises through the full height of the building, from the basement to the top floor, beautifully constructed with a moulded handrail and turned balusters and lit from the windows situated in the central bay of the north wall. The list of other important surviving features is a long one: a magnificent grey marble fireplace in the dining room from c1740; plaster cornices in both of the downstairs rooms along with the recently rediscovered and significant remnants of bolection-moulded panelling from the late-17th century; large sections of original field panelling in the first-floor rooms as well as extensive cornicing; two more mid-18th century doorcases with broken pediments on the first-floor landing; an early 19th century fireplace, and so on. A blocked doorway on the second floor landing once opened onto a small viewing balcony that looked down into the adjoining medieval hall. 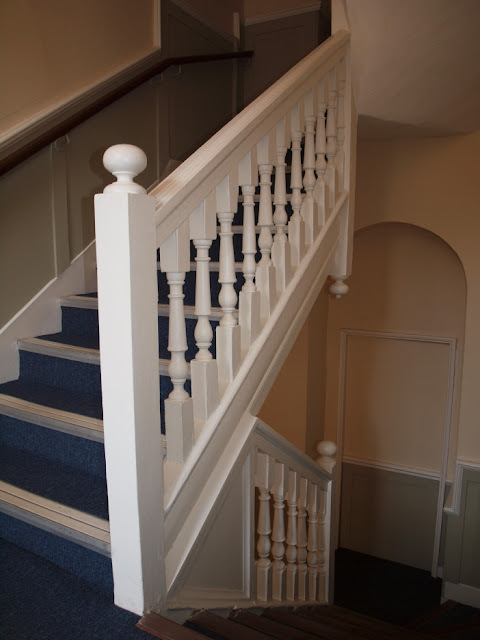 (The barley sugar spindles of the balcony are still visible inside the hall). Even the basement has numerous interesting features, such as slate floors and the above-mentioned mullioned windows. The photograph right is the view east from a small window on the third floor of the Notaries' House. It looks out over the medieval houses of the Archdeacons of Totnes and Barnstaple, over the still-standing 15th century gatehouse of the Abbot's Lodge (the gatehouse was destroyed in 1942 but superbly reconstructed afterwards) and towards the 18th century terraces of Southernhay West, just visible through the trees. 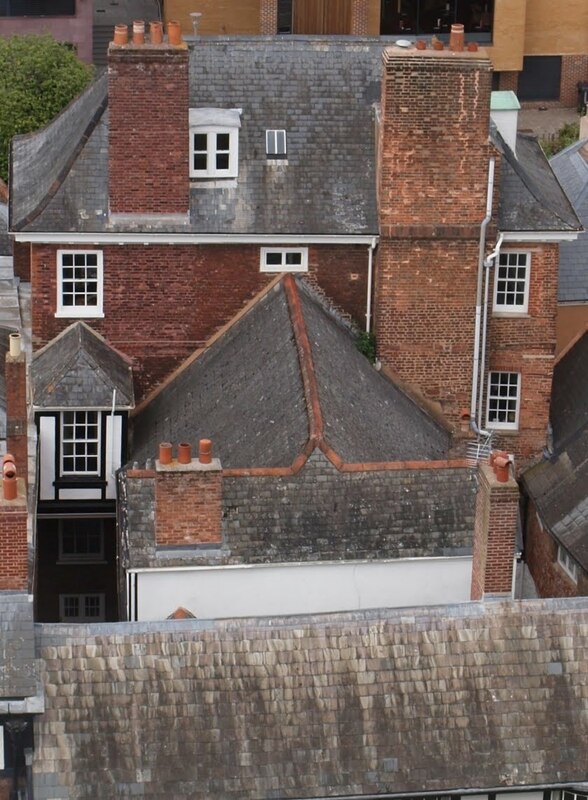 On the far right are the white walls of the former Chancellor's House, remodelled in the early 18th century and now the Exeter Cathedral School. It is all exceptionally lovely, a collection of buildings of such picturesque charm that they have few rivals in the whole of England. Incidentally, it is called the Notaries' House because it was for a number of generations used by solicitors as their offices, but the site itself is believed to have been the location for part of the timber barracks of the Second Augustan Legion when the Romans built a fortress here in c55 AD. 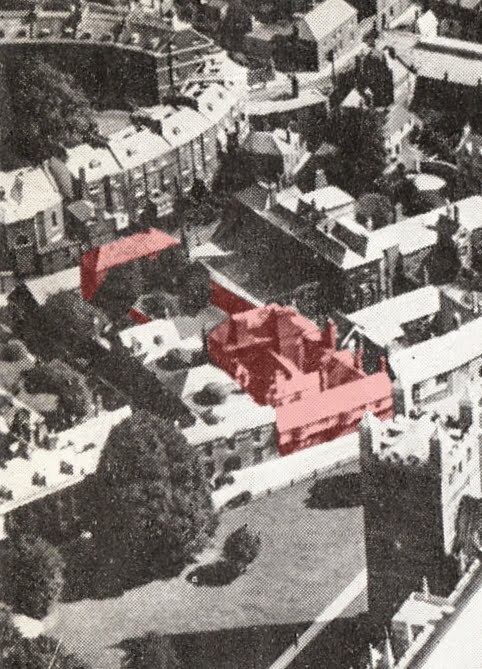 The above-mentioned stable block was damaged during the Blitz of 1942 and half of the garden disappeared under the post-war service road known as Chapel Street. The other half is a car park. 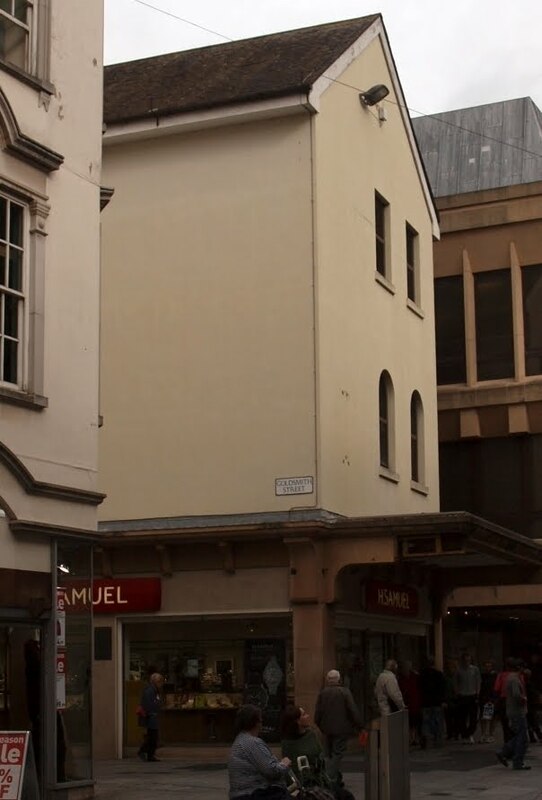 The businesses now based in the house use Chapel Street as their address and the main access in and out of the property is now in Chapel Street, although the house is still technically listed as No. 8, Cathedral Close. It is perhaps unfortunate that the Notaries' House has been converted into offices and retail space but then it's miraculous that it survived the war undamaged. Many of the modern additions necessary for its current use are a distraction but a huge number of historically interesting features do remain, along with much of the general fabric of the early building. 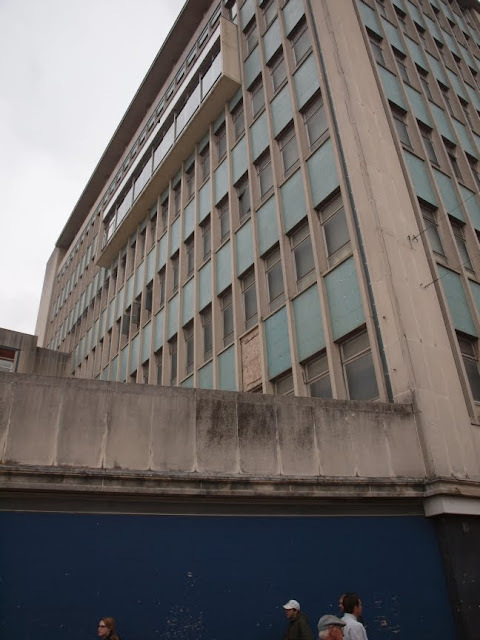 Hopefully the building's Grade II* listed status will protect it for future generations. As the archaeological report concludes, "with its fine staircase, panelling, fireplaces and other fittings, the Notaries' House must rank as one of the best-preserved examples of grand town housing of this period in the city".